Once the dough for the Danish is chilling in the refrigerator, it’s time to think about what you are doing to fill them with. I wanted to recreate the custard-and-apple combination of a delicious pastry called Apple Tarte Normande, so I chose to use pastry cream and diced apples. I’m extremely particular when it comes to pastry cream. You see, nowadays the custard is usually thickened with cornstarch, but I prefer the old-fashioned method of using flour. I find that cornstarch always leaves an unpleasant starchy aftertaste, even though it’s supposed to cook off. Using flour yields a purer, cleaner flavor. The only downside to using flour is that it takes a few extra minutes of cooking time for the pastry cream to thicken up, but I think that it’s worth sacrificing a few minutes to get a better-tasting result. As for the apples, I chose to employ a technique that we used all the time at pastry school, which was referred to by the horrifyingly industrial-sounding title of “pre-baked apples.” Doesn’t that sound almost as bad as “modified food starch” and “fractioned palm oil”? Name aside, the technique is a very useful one. Diced apples are spread out on a rimmed baking sheet, sprinkled plentifully with butter and sugar, covered with tin foil, and then roasted in a low oven until they are just tender. As the fruit cooks, it releases water, which is drained off once the apples are done. 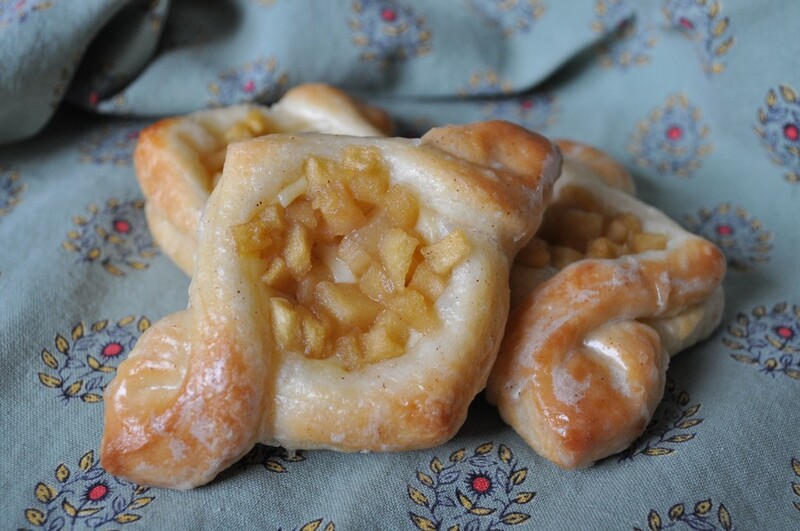 Now when the apples are added to a pastry like a tart or Danish, there is no worry about their releasing juices that could turn the dish into a soggy mess. Also, the baked apples don’t have to be used right away: they can be stored in either the refrigerator or freezer, and then pulled out when need demands. And since pastry cream can also be refrigerated, you can make both of the fillings on the same day as the Danish dough, and leave everything in the refrigerator overnight. And then on the next day you will actually make the Danish. So I’ll be back tomorrow to finish up this mini-series. In a large bowl, whisk together the egg yolks and sugar. 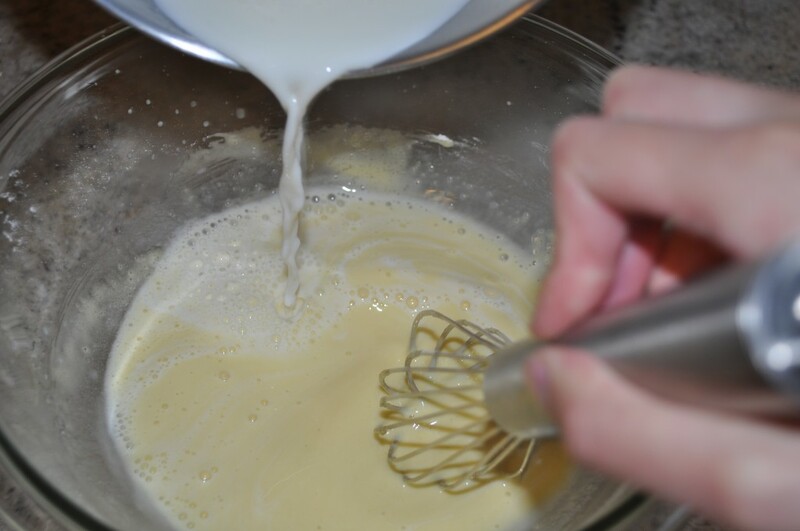 Then sift the flour over the egg-sugar mixture, and whisk it in thoroughly. Pour the mixture back into the saucepan and place it over medium heat. Bring to a boil, whisking constantly and occasionally scraping down the sides of the pan with a rubber spatula. 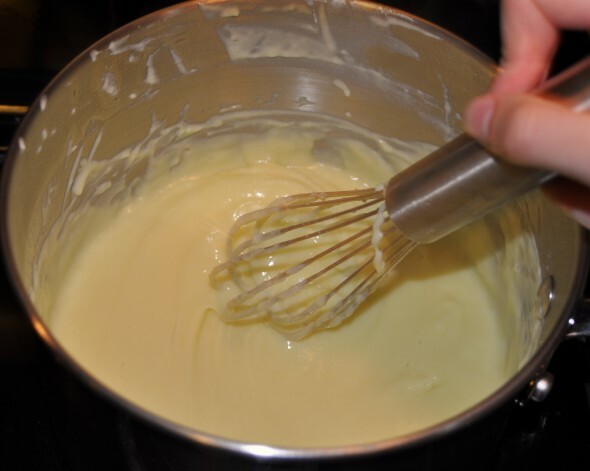 Continue cooking the cream until it is thickened and shiny, still whisking constantly. Set a sieve over a clean bowl and pour the pastry cream through it. This will strain out any bits of eggs that might have curdled. Add a tablespoon of vanilla extract, then taste the cream and adjust the flavoring to your liking. Cover the pastry cream with plastic wrap, pressing it onto the surface of the cream to keep a skin from forming. If you don’t want to put plastic wrap directly onto your food, you can also rub the surface of the cream with butter or sprinkle it with sugar to keep the skin from forming. Then, right before you use the pastry cream, you can just stir the sugar or butter into it. Store the pastry cream in the refrigerator for up to five days. The pastry cream will set up in the refrigerator, so to re-condition it to a proper piping consistency, push it through a sieve and then beat it with a spoon until it is soft and smooth again. Note: There are no amounts for this recipe; it’s really just a technique. Besides, the amount of sugar will vary depending on how sweet the variety of apple you are using is, and the amount of butter is mostly a matter of choice. If you don’t want to add a lot of unnecessary fat, you can probably get by with a sparse scattering. If, however, you feel that you might as well follow through to the very end (after all, there’s already so much butter and egg and sugar in these Danish that it can’t possibly make that much of a difference), you can be more liberal. It’s like dotting the filling of an apple pie with butter. If you don’t make apple pie very often, just use my photograph above as a guide. Cut each apple in half, and then use a melon baller to scoop out the core. Trim off the stem and blossom ends with a knife. Spread the diced apples out on a baking sheet lined with parchment paper. Sprinkle with sugar and toss to combine. 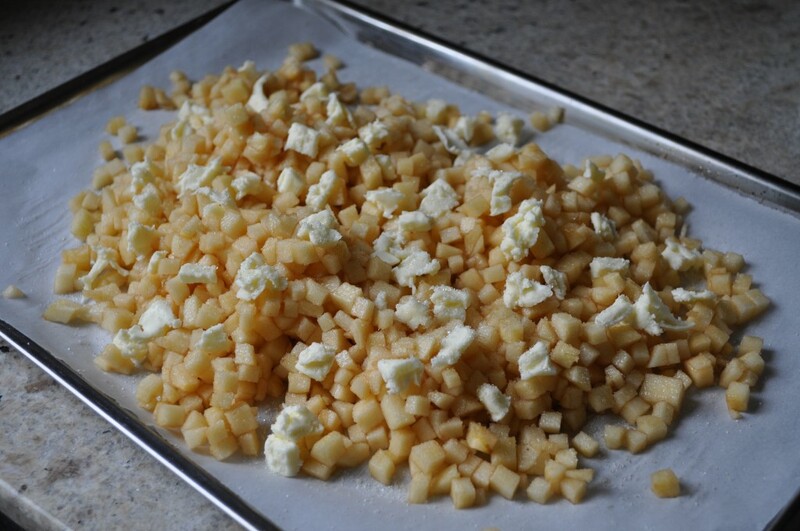 Cut small chunks of butter and dot them across the apples. Cover the pan with foil. Roast in a 325° (160°C) oven until tender, about 30-45 minutes. The baked apples can be stored in the refrigerator for a few days or frozen for up to two months.